Acacia and psyllium are two dietary fiber supplements marketed for various purposes. Psyllium is most commonly used to relieve constipation, and acacia -- though less common -- appears effective for this purpose as well. As is true of other soluble fibers, both acacia and psyllium may help promote healthy weight, and psyllium can help lower cholesterol. Consult your doctor before taking supplements of any kind. All supplements have the ability to cause side effects. Soluble fiber is present in your diet in foods such as oat bran, beans and other legumes, as well as some fruits and vegetables. During digestion, soluble fiber attracts and absorbs water, mixing with it to form a gel-like substance that promotes digestive health. It's this quality that makes fiber supplements beneficial for constipation. Acacia and psyllium come from plants but are not found naturally in foods -- though they're sometimes added to them. Both are typically taken as a dietary supplement in powder form. Both acacia and psyllium are effective for relieving constipation, according to a study published in the "Journal of Pediatrics" in 2012. Researchers compared the effectiveness of the two fibers in children with chronic functional constipation -- a condition characterized by infrequent bowel movements. They found that both were equally effective at relieving constipation, with no noticeable difference between the two. Along with a healthy diet and exercise plan, both acacia and psyllium may help fight obesity. A study published in 2012 in the "Nutrition Journal" found acacia significantly reduces body fat percentage and BMI -- a measure of body fatness -- in healthy women. 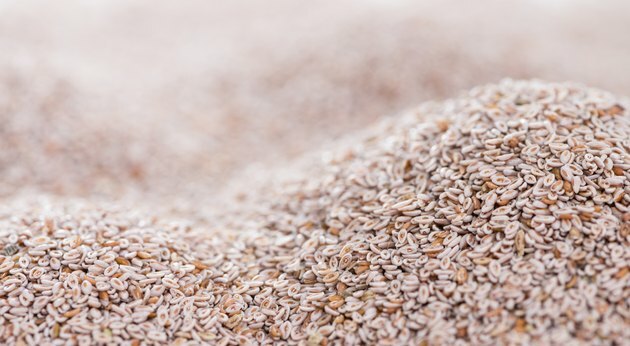 A similar study published in the "European Journal of Clinical Nutrition" in 2009 reported that psyllium reduced BMI, fasting blood sugar, waist circumference and triglycerides in people with Type 2 diabetes. You can get the same benefits by eating a diet rich in fiber. Consume at least 20 grams of fiber from food, not supplements, recommends the Harvard School of Public Health. Most fiber foods contain a mixture of soluble and insoluble fiber -- the latter does not dissolve in water and helps add bulk to stool. If the current fiber content of your diet is low, increase it gradually to avoid digestive discomfort. A fiber-rich diet includes plenty of fruits, vegetables, grains and legumes.